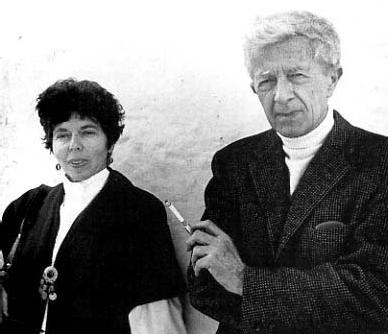 In March 1977, as I was beginning work on my biography of Jane Bowles, I arrived in Tangier to meet Paul. I had had a pleasant but formal correspondence with him. I had, of course, read his work with its dark over- and undertones. I knew that Jane had called him “Gloompot”. I suppose I expected someone formal and rather dour, perhaps even dark in his daily aspect. On that first visit of six weeks my routine was unvarying. An early riser, I worked on my notes and questions in the morning. In the mid-afternoon Paul, who was a late riser, would come by the hotel in his car, driven by Abdelouahaid Boulaich, and then we would go to Paul’s apartment in the Immeuble Itesa. After tea and conversation with visitors—there were always visitors—Paul and I would talk, often for four or five hours, of Jane and her work. Our conversation ranged widely, over Jane’s life, over his and Jane’s life together and apart. His willingness to be of help to me was unlimited. There was never, I felt, any evasion on his part, which was all the more astonishing considering how the darkness of her death lingered with him. I had brought with me information I had unearthed about her early and later life that he did not know. I had brought, as well, copies of sections of her unpublished manuscripts which were in the archive at the Humanities Research Center in Austin, Texas. Although these manuscripts were previously thought to be in a chaotic jumble, I had found them to have their own specific order. I was eager and excited, full of ideas and theories. Paul didn’t hold much for theories about behavior and over those weeks and my subsequent two visits to Tangier I came to learn a lot from him about the limits of theory in the knowing about others. I had never met Jane. She had died four years before, in May 1973, just as I came upon her work. Though she was my subject, Paul was the transmitter. He had the capacity to be present forcefully in his own being and yet to be the transmitter in a remarkably patient way. I saw much other evidence of this patience in him with others too. Though Paul had an established literary reputation at the time, he was in the world’s terms, if not neglected, certainly not famous. Still, unannounced visitors came in an unending stream to his apartment, brought by admiration and curiosity about him and his work. In the years since 1977, as he became a legendary figure, that stream turned into a flood, and the sheer number of visitors could no longer be reasonably accommodated But then, as I remember, he turned no one away. Young writers came to him, seeking advice or simply conversation. Readers, young and old, who were caught up in his subject-matter and style, appeared. Others came for obscure reasons, as if they were seeking in him a monument, matching something in their own psyches. Still others came with demands, not clearly articulated. No matter how serious or how flaky, the visitor was welcomed with tea and attention and conversation. In his autobiography and in interviews Paul always took the stance of someone abstracted from others, not deeply connected to others. Nonetheless, as I observed it, there he was unfailingly courteous, giving of his time with apparently little thought of return. Was each person equivalent to every other for him? No, I don’t think so. I think his acceptance of others, as they came to him, had something to do with some profound choice in him not to judge, allied to his belief that ultimately no one is knowable. Yet at the same time as he adhered to this ethical vision—for it was an ethical and moral choice on his part, I believe—he accepted the imposition upon himself of stringent external and formal rules of behavior that arose from an earlier time in his life, from his parents’ teachings, perhaps. Virginia Sorensen Waugh once said to me, “Paul’s a saint”, and I knew at once what she meant. Not a saint in ordinary terms—if one can use the word “ordinary” about saints—but saintly in his adherence to his own vision of judgement and morality. In Paul’s writing I detect the same combination of ethical choices, the refusal to judge his characters and the acceptance of the imposition of formality—and form—as binding upon him (which is perhaps another way of accepting Fate). But I see I have fallen again into my old habit of theorizing. What I wanted to say about meeting Paul was simply this: out of my experience as the writer of the biography of Jane, I came to feel about Paul that he was a figure distant yet close, mysterious yet open, and above all, endearing. His effect lingers. MILLICENT DILLON is the author of four books on the Bowleses, A Little Original Sin: The Life and Work of Jane Bowles, You Are Not I: A Portrait of Paul Bowles, Out in the World: The Selected Letters of Jane Bowles (editor) and The Viking Portable Paul and Jane Bowles (editor). Dillon is also a novelist and playwright. A native New Yorker, Millicent Dillon was trained as a physicist and worked in Oak Ridge, Princeton, and Kettleman Hills before moving to the San Francisco Bay Area, where she has lived for many years. Dillon has been a Guggenheim Fellow (1993) and a resident writer at Yaddo, at the Rockefeller Foundation in Bellagio, Italy, and at the Djerassi Foundation in Woodside, California. A five-time O' Henry Award winner, she has published short stories in the Threepenny Review, the Southwest Review, and many other literary magazines. Her play "Prisoners of Ordinary Need" was part of the San Francisco Playwrights Festival in 1990. Dillon's novel Harry Gold (New York: The Overlook Press / Peter Mayer Publishers Inc.), published in 2000, was a finalist for the PEN/Faulkner Award for Fiction. Ms. Dillon recently completed a book-length memoir, The Absolute Elsewhere, an account of the time (1947) when she worked in Oak Ridge, Tennessee on the NEPA project, (Nuclear Energy for the Propulsion of Aircraft) She just completed a novel, The Evicted.